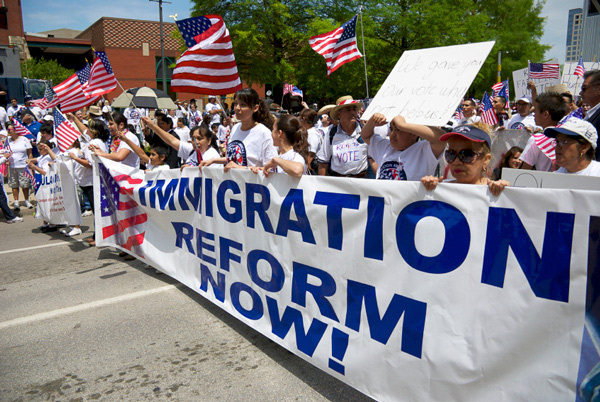 Comprehensive immigration reform in its current incarnation as The Border Security, Economic Opportunity, and Immigration Modernization Act, referred here as S. 744, is making its way from the Senate Judiciary Committee for a full debate and vote on the Senate Floor . A recent Washington Post article finds that most Americans, 58 percent, support the most controversial aspects of the bill, the 13 year path to eventual citizenship . While not capturing headlines, this bill will have a dramatic impact on the functionality of the H-1B temporary worker program. New requirements by employers seeking a qualified candidate could stymy the intent of the H-1B program—to bring highly qualified, specialized in-demand professionals into a thriving and competitive US economy. Will the Senate’s version of the Comprehensive Immigration Reform Bill cap out the future H1B visa? S. 744 provides for an overall increase of the annual H-1B cap. The cap would increase from a minimum of 110,000 with the potential to reach up to 180,000. According to the bill, a market based calculation premised on the number of H-1B visa petitions in excess of the cap and the average number of unemployed persons in the “management, professional and related occupations” categories based on Bureau of Labor Statistics employment reports will be used annually to determine the actual cap number for that fiscal year. While the increase in H-1B visas is applauded, the complicated computation is further confused by the stipulation that despite the market based calculations, the variance in the number of available visas in the next fiscal year cannot be greater or less than 10,000 visas from the prior year. In addition, S. 744 increases the Master’s Cap from 20,000 to 25,000. Again, while the cap increase is good news, the new Master’s Cap would only apply to those who attained a Master’s degree or higher from a U.S. university and limited to those students with a STEM degree- that is degrees in the sciences, technology, engineering or math based on the department of education’s classifications system. The Senate bill also puts into place new burdens on employers by requiring them to implement advertising and recruitment measures by placing comprehensive and detailed job advertisement on the Secretary of Labor web site. H1B Employers would also have to conduct what Senator Hatch’s Amendment 12 states as a “good faith recruitment of United States workers in accordance with industry standards”  H1B Employers will need to establish that an American worker was not displaced by the foreign-born nonimmigrant worker within 90 days prior and after the date of filing the H-1B petition. The displacement period is increased to 180 days for H-1B dependent employers. The bill does, however, carve out an exception for this non-displacement attestation if a non-H-1B dependent employer maintains the same number of US workers in the same job category from the previous year. Non-dependent H1B employers will also be subject to the non-displacement attestations, which until now have only been applicable to dependent employers or willful violators. S.744 requires that a dependent employer take further additional measures in order to ensure they did not displace an American worker with similar qualifications. S.744 discourages the use of employer outplacement positions by prohibiting H-1B dependent employers from outsourcing or contracting out the services of an H-1B employer. A non-H-1B dependent may do so but must pay an additional $500 fee. Third-party contracting positions are often typical business models for many IT and other consulting firms and these measures will undoubtedly alter the consulting industry. It is imperative to prevent abuse of the H-1B program by employers. However, investigations and audits of employers utilizing the H-1B program should be targeted and narrow. S. 744 looks to broaden the scope of inquiry by increasing the length of inquiry into an H-1B complaint from 12 months to 24 months. The bill would also allow Homeland Security in initiate its own inquiries and authorizes annual H-1B compliance audits for any employer with more than 100 employees if more than 15% are in H-1B status. These measures and additional amendments are quite ambiguous and could cause far reaching regulatory interpretations resulting in the likely increase in time from H-1B filing to approval. In a fast paced, global economy, US firms need the ability to acquire highly skilled professionals in a streamlined and timely manner and have the detrimental effect of discouraging US companies from sponsoring a talent pool that is otherwise not available in the US economy. While it makes more sense for Congress to make these requirements for immigrant employment based visas, these requirements create such an onerous burden on employers seeking temporary non-immigrant visas that US businesses may stop utilizing the program. This would have the end result of the US businesses loosing out on much of the best-qualified talent and reduce American competitiveness. 2 The Washington Post article can be found here. 4 Occupational job zone categories are based on the Department of Labor’s Occupational Information Network Database (O*NET).